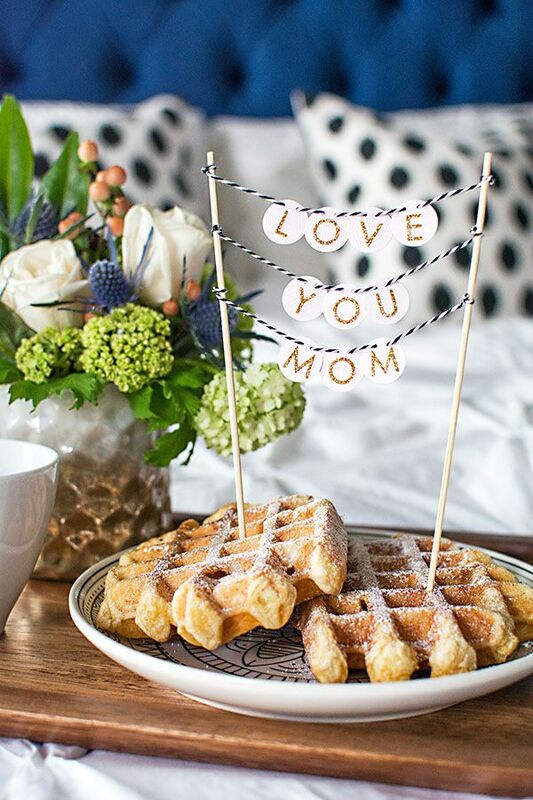 Start Mother's Day off right with your mom, or for your wife on behalf of the kids by making a mini I love you mom garland that you can stick into her breakfast stack of waffles or pancakes. The sweet DIY idea will make her breakfast in bed seem extra special. Your mother works hard and deserves some time to relax and pamper herself with some quality alone time. An easy way to help your mom relax is to make her a jar rose petal bath soak that she can pour into her bath, allowing her to relax in the bath with small floating rose petals. To make the gift seem, extra professional, stick the printable chalkboard label on the top of the jar. Surprise your mom on Mother's Day with breakfast in bed by serving her meal on a DIY tray that she can later use all year round. To make your own floral breakfast tray you can use decorative tape and wrapping paper to give Ikea's Trendig tray a new look. To complete the breakfast in bed tray add your mom's favorite breakfast food, a small vase of fresh flowers and a card to wish her a happy Mother's Day. Create a set of custom painted monogram napkins for your mom in bright cheerful colors with a matching painted edge that she can use the next time she invites all the family over for a dinner party. Does your mom love to cook with fresh herbs? Is so make her a herb garden starter kit by using clay to craft herb plant markets, and add some assorted herb seeds and floral sheers to a basket to give her everything she needs so she can start growing fresh herbs in her garden to cook with this year. Get your gift for Mother's Day ready in minutes by making your mom a silly custom plaque that you can decorate with gold patterned paper and stick on letters. The great thing about this DIY is it perfect for kids, and easy to customize by switching the pattern on the paper or the message. Surprise you mom by making a set of modern floral notebooks that she can use to jot down notes or as a journal. These lovely books can be made in just a few minutes and will make a great gift for your mom as everyone could always need some extra beautiful stationary. Celebrate Mother's Day with a delicious homemade cake topped with a handmade Mother's Day cake topper that you can make by cutting out the template with your Cricut. Complete your wrapped gift or bouquet of flowers for your mom this Mother's Day by attaching a lovely printable Mother's Day gift tag that makes any gift seem extra special. Take a small wood box with a lid and paint it white and glue on a beautiful decorative crystal on top for the perfect spot for your mom to store some of her jewelry. Make a heartfelt gift this Mother's Day by making her a box of photo tea bags. The custom tea bags are made by attaching a photo of the two of you together on the ends of the tea bag. The next time she wants to unwind, she can pour herself of tea and will get to see a photo of the two of you that is certain to make her smile. These polaroid photo magnets make a great gift for your mom or grandma for Mother's Day as they will love photos of their kids or grandchildren which they can display in their kitchen or office. Quickly make any chocolate bar seem extra special for Mother's Day by printing one of the candy bar wrapper templates that can go around your chocolate bar. Your chocolate loving mom is sure to be pleased when you surprise her with some sweets. Help your mom feel extra pretty this Mother's Day by making her a sweet smelling bangle bracelet that she can wear that is made out of fresh flowers. To complete the gift make sure to print the gorgeous floral gift tag that doubles as a card where you write inside the tag why you love your mom. Need a gift idea for your mom? Gift your mother a small house plant this Mother's Day that you can plant in a custom planter using a small food tin wrapped in a printable watercolor plant wrapper. If you do not know what to get your mom this Mother's Day, one easy idea is to make her a mason jar with all the dry ingredients she needs to make a delicious batch of cowgirl cookies, which are soft and chewy cookies with pink M&Ms and pecans. To complete the gift print one of the labels to on the jar and your mom can have sweet and delicious cookies the next time wants to have something sweet. If one of your mom's favorite hobbies is trying to cook new dishes, then a set of beautiful classic tea towels she can use that were made by her child would be a welcomed gift. Learn how to make your own set of tea towels for your mom by using white tea towels and paint. Make your mom a custom tote by either sewing your own bag or using a blank tote and iron on the free printable design that says I love you mom in French in the center of a large heart. Next time your mother needs to go shopping she can carry all her purchases in her new bag that you made her. Treat your mom with some homemade soaps that have beautiful floral petals in them by using a popsicle mold to form your bars of soap. Once your soap has set you can wrap the soap with some clear wrap and tie a ribbon around the stick for a gift that looks like that it came from a trendy beauty boutique. Give your mom one of a kind hand painted container with stylish organic brushstrokes that she can use for storage, as a decorative accent or as a vase. This is a great DIY idea for the kids to try for mom as they can showcase their artistic talent by painting on a glass cup or small vase. For your fashionista mother make her a stylish leather tassel key chain that she can attach onto her purse for some extra flair to her outfit. To make this great gift all you need is a key chain loop, a small piece of leather and some glue, there is no sewing required! Your mother is sure to adore this modern jewelry holder that can be hung in a closet or bedroom to store necklaces or bracelets. To make your own simply cut a wooden block and glue a metal dowel to the block using wood glue. To hang attach a sawtooth hanger to the back of the block. Creating a tea towel of your child’s art is a wonderful way to display your child’s masterpiece. To transfer your child’s drawing onto a tea towel simply place a white tea towel over the top of the drawing and using a permanent marker simply trace the design onto the tea towel. If you are having a hard time viewing the drawing underneath you try tracing the drawing on a window which will work as a light desk. It is easier than you think you create an apron that your mom is certain to love while cooking in the kitchen. To make your own you will need 1 yard of fabric and ½ yard of white muslin for the straps and ruffles. For the top piece of the apron, you will cut a rectangle with a heart or sweetheart neckline. While the bottom piece is a rectangle with the bottom two corners rounded off. After it is simply a matter of using your sewing machine to sew the two pieces together, adding the straps and ruffles around the apron. Head over to your local second-hand shop and pick up a vintage tea cup to make your own candle out of. To make your own candle it is just a matter of adding the heated wax and the wick to a tea cup and you have your own adorable teacup candle that is sure to please mom. Mom is sure to love this gold accent vase that she can use to display either store bought flowers or fresh cut flowers from the garden. To make your own gold accent vase you’ll need a glass vase, gold paint, a foam brush and some painters tape. Design your vase by taping off stripes and painting between the painter's tape with gold paint. Help your mom relax after a long day with these bath bombs that will fizz in the tub and help soften her skin. To make your own bath bombs you will need a plastic mold to form the bomb, baking soda, citric acid, witch hazel, your favorite essential oil, and if desired natural colorants. To make the bath bomb simply combine the coloring, baking soda, citric acid and essential oils. Lightly spray the mixture with witch hazel and press into the molds. Surprise your mom by creating a dramatic focal wall out of a plastic trellis decorated with mom spelled out of 125 carnations. The best part is as the flowers are just threaded through the trellis, at the end of your Mother's Day celebration you can pull out the carnations and present you mom with a ginormous bouquet of flowers. Start Mother's Day off for your mom by pampering her with breakfast in bed topped with this cute printable Mother's Day food flag that you can easily stick into her favorite breakfast treat such as pancakes or muffins. If you are planning on buying flowers for your grandmother, mother or mother-in-law this Mother's Day make sure to download these cute tag cards that you can tie around the bouquet. Encourage your mom to pamper herself this Mother's Day by making her a sweet smelling rose body scrub that she is sure to enjoy. Help mom feel like a queen for the day by making her a crown to wear this Mother's Day. After you have baked your mom's favorite treats package them up with these Mother's Day baked goods packaging templates that you can assemble yourself. Does your mom enjoy a cup of tea? If so make her some custom tea bags that you can fill with her favorite tea blend and to complete the tea bag set decorate the DIY tea bags with Mother's Day themed tea bag tags that you can print at Lia Griffith. Create a large Mother's Day banner using cardboard and flowers and email a photo of yourself holding your banner to send to your mom. If you are looking for an inexpensive gift idea take an empty photo frame and decorate the mat with colorful patterned paper and add a photo of your mother and yourself. Create a set of beautiful Japanese inspired patterned bowls by using ceramic paint to update regular small white bowls. Create a unique hand painted design on each bowl and package the bowls as a set for mom to use in the kitchen or to store jewelry in. Make your mom a set of elegant lace flats that she can wear while strolling around the city with this easy DIY project that can be done in half an hour. Sew mom a beautiful leather bottom tote bag that she can use a weekender bag for travels, for shopping, or to carry her yoga gear on the way to the gym. Spoil mom this Mother's Day with homemade delicious macarons decorated with painted gold detailing.